Abstract. Fingerprinting ocean acidification (OA) in US West Coast waters is extremely challenging due to the large magnitude of natural carbonate chemistry variations common to these regions. Additionally, quantifying a change requires information about the initial conditions, which is not readily available in most coastal systems. 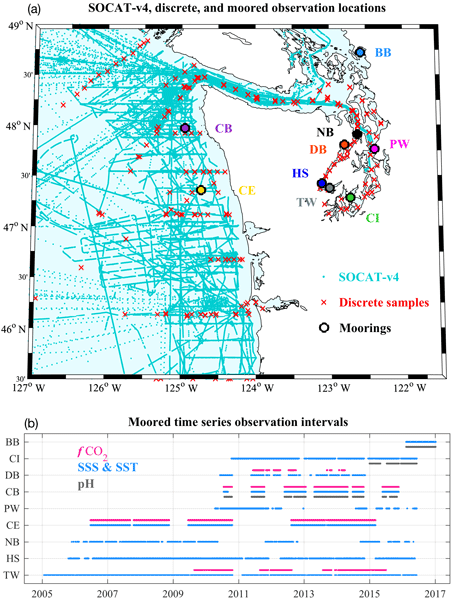 In an effort to address this issue, we have collated high-quality publicly available data to characterize the modern seasonal carbonate chemistry variability in marine surface waters of the US Pacific Northwest. Underway ship data from version 4 of the Surface Ocean CO2 Atlas, discrete observations from various sampling platforms, and sustained measurements from regional moorings were incorporated to provide ∼ 100000 inorganic carbon observations from which modern seasonal cycles were estimated. Underway ship and discrete observations were merged and gridded to a 0.1° × 0.1° scale. Eight unique regions were identified and seasonal cycles from grid cells within each region were averaged. Data from nine surface moorings were also compiled and used to develop robust estimates of mean seasonal cycles for comparison with the eight regions. This manuscript describes our methodology and the resulting mean seasonal cycles for multiple OA metrics in an effort to provide a large-scale environmental context for ongoing research, adaptation, and management efforts throughout the US Pacific Northwest. Major findings include the identification of unique chemical characteristics across the study domain. There is a clear increase in the ratio of dissolved inorganic carbon (DIC) to total alkalinity (TA) and in the seasonal cycle amplitude of carbonate system parameters when moving from the open ocean North Pacific into the Salish Sea. Due to the logarithmic nature of the pH scale (pH = −log10[H+], where [H+] is the hydrogen ion concentration), lower annual mean pH values (associated with elevated DIC : TA ratios) coupled with larger magnitude seasonal pH cycles results in seasonal [H+] ranges that are ∼ 27 times larger in Hood Canal than in the neighboring North Pacific open ocean. Organisms living in the Salish Sea are thus exposed to much larger seasonal acidity changes than those living in nearby open ocean waters. Additionally, our findings suggest that lower buffering capacities in the Salish Sea make these waters less efficient at absorbing anthropogenic carbon than open ocean waters at the same latitude. NOAA Pacific Coast Ocean Observing System cruise data, https://doi.org/10.5281/zenodo.1184657 (Fassbender et al., 2018). How to cite: Fassbender, A. J., Alin, S. R., Feely, R. A., Sutton, A. J., Newton, J. 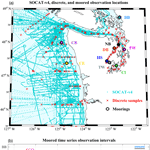 A., Krembs, C., Bos, J., Keyzers, M., Devol, A., Ruef, W., and Pelletier, G.: Seasonal carbonate chemistry variability in marine surface waters of the US Pacific Northwest, Earth Syst. Sci. Data, 10, 1367-1401, https://doi.org/10.5194/essd-10-1367-2018, 2018. Ocean acidification (OA) is difficult to identify in coastal marine waters due to the magnitude of natural variability and lack of historical baseline information. To provide regional context for ongoing research, adaptation, and management efforts, we have collated high-quality publicly available data to characterize seasonal cycles of OA-relevant parameters in the Pacific Northwest marine surface waters. Large nonstationary chemical gradients from the open ocean into the Salish Sea are found.